50 Tunes is a 3-CD set of early American and Celtic fiddle tunes common to the people of the 1800s. Many of these tunes were played by early pioneers for their evening square dances. 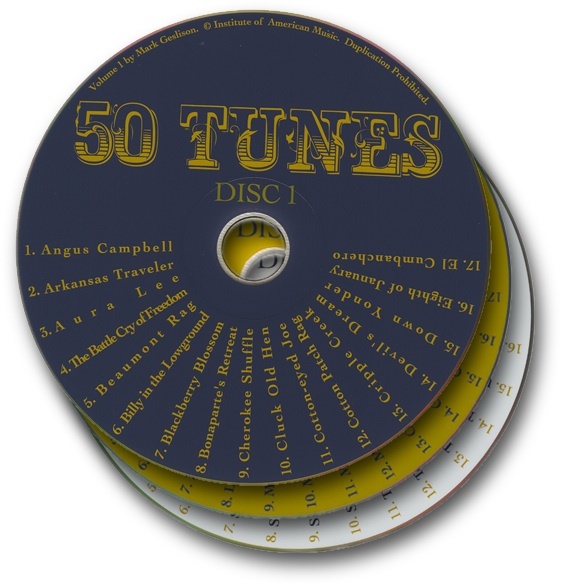 This 3-CD set of 50 tunes is a good resource for anyone interested in incorporating old time pioneer dances at modern pioneer treks, or just for a good old hoedown. Please contact us to purchase these CDs. For more Barn Dancing resources, take a look at our videos and free downloads. © 2002 Geslison Groberg, LLC. Thanks for this music! Loving all of it. Do you happen to have sheet music / tablature for the tunes on these CDs? I had a friend years ago who had books of Bluegrass sheet music for each instrument written by a BYU professor….we had so much fun playing the songs and I’m trying to get my hands on those books again. Wondering if it might have been you who wrote them?? Or if maybe you know where I can find them? Please help me!! : ) I have resurrected my banjo after not playing for 12 years and I’m dying to re-learn some of these songs!